The long-lost bag used by US astronaut Neil Armstrong to bring back to Earth the first samples of moon dust is expected to sell for up to $4 million when it is auctioned with other space memorabilia next week in New York City. The sale at international art auction house Sotheby’s also features the Apollo 13 flight plan annotated by its crew, a spacesuit worn by US astronaut Gus Grissom, and lunar photographs taken by the National Aeronautics and Space Administration (NASA). The auction will be held on July 20, the 48th anniversary of the first moon landing, and organizers hope it will draw large crowds. “It (space) is one of few subjects that I think are not culturally specific. It doesn’t matter your religion, where you’re from, what language you speak,” Cassandra Hatton, a vice president and senior specialist at Sotheby’s, said on Wednesday. 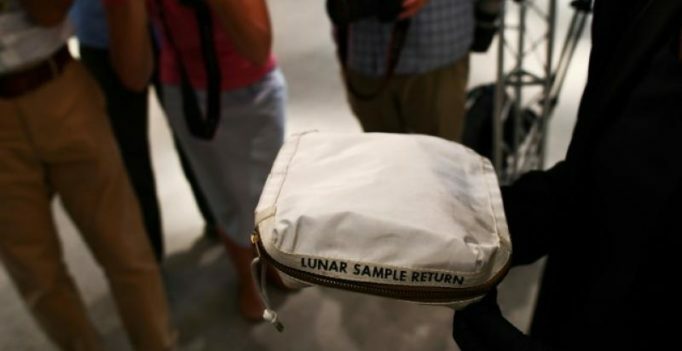 The fate of the bag, which measures 12 inches by 8.5 inches and is labeled “Lunar Sample Return”, was unknown for decades after Armstrong and his Apollo 11 crew came home in July 1969. For years it sat in a box, unidentified, at the Johnson Space Center in Houston, Hatton said. It ultimately surfaced in the garage of the manager of a Kansas museum, Max Ary, who was convicted of its theft in 2014, according to court records. The bag was seized by the US Marshals Service which put it up for auction three times, drawing no bids, until it was bought in 2015 for $995 by a Chicago-area attorney, Nancy Lee Carlson. She sent the bag to NASA for authentication, and when tests revealed it was used by Armstrong and still had moon dust traces inside, the US space agency decided to keep it. Carlson successfully sued NASA to get the bag back, and the attention created by her legal challenge prompted many inquiries from potential buyers, according to Sotheby’s. That led Carlson to decide to auction it again. Hatton said she was sure the bag would find a good home. Such artifacts usually go through the hands of several different owners over the years, she added.